Caption: Mediterranean House and Italian Garden with tulips. Juno and Portico in view. ...and explore nearly two centuries of images that document the creation and the development of the Missouri Botanical Garden. You will be greeted by ladies with parasols, children in their beautiful nineteenth century clothing, and even the Garden's founder, Henry Shaw. In these historical images you will see many buildings and gardens which today's visitor might recognize but many which are now changed, or lost forever. 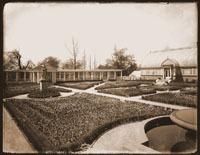 More than five hundred images are available for viewing and are taken from the Garden Archives. These include glass plate negatives, hand-tinted prints, stereographs, postcards and manuscripts. Begin your journey by searching this database directly, browsing the subject list or reading the historical timeline. We hope you enjoy this opportunity to visit this bygone era filled with beauty and splendor.